Here are 10 pictures taken May 20 at our block party. So many young families now! Chris Tallman supplies this monthly market data to keep residents informed on home values. He has an 18 year connection with Huntley Hills and was a 14 year homeowner who raised his family here, so he knows the benefits, features and values of the neighborhood. He helps many people in Huntley Hills fight inflated home tax assessments with the county at no charge. He also does a free market analysis for anyone who asks and gives advice to residents who are considering selling their homes whether they use him as their agent or not. The Department of Public Works graciously installed a third Huntley Hills sign for us. This one is at the south end of Admiral Dr., near the High School. The Huntley Hills Neighborhood Association has been able to purchase these signs with your help: each one costs the amount earned from the memberships of 62 households. 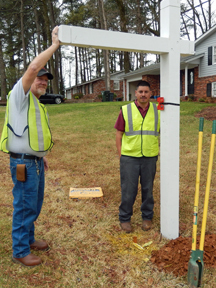 The first picture shows DPW employees Tim Mathis and Rudy Ruiz holding the post in the hole. The man bracing the post in the second picture is Joe Tipton, Assistant Director of the DPW. during the traffic calming process – he was awesome at getting signatures and even took on some streets other than his portion of Admiral. He was one of the best volunteers. Before he was born, his father was in charge of dredging mangrove-covered sandbars to create Longboat, Siesta and Lido Keys. They owned their home, had two cars and a telephone. Then the Great Depression arrived. They sold one car and let go of the telephone. 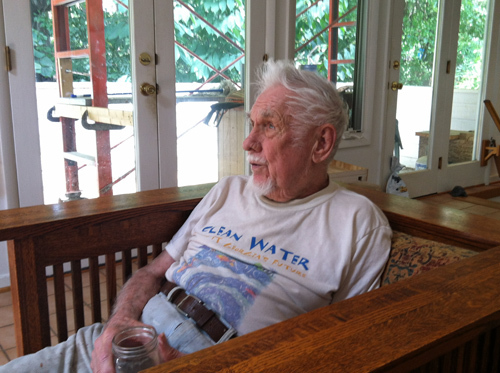 Instead of his steady job in Sarasota his father had to pick up small jobs working on flood control and the intercoastal waterway. They moved 24 times by the time he started second grade.